Paris Roubaix is a race that attracts me because it goes ‘off-piste’. In the present era media giant SKY Television has built its global reach upon football, the sport was the lynchpin of the SKY satellite TV business model and it revolutionised how football and sport in general is financed. Cycle sport also had a strong connection with the media industry as many of the races we know best were created to make a point or to popularise a newspaper or undermine another. The Giro d’Italia was created to promote La Gazzetta dello Sport in 1909, ‘Het Volk’ was promoted after World War Two to make a point about the Tour of Flanders which many considered had too close an association with the Nazi occupation, and the Tour of Flanders itself was created to promote the Flemish cause in Belgium in 1913 through the magazine Sportwereld . At the end of the 19th century France was the hotbed of cycling and Belgian races such as Liege-Bastogne-Liege had trouble drawing riders to it. With the French cycle race scene being so lively two textile magnets successfully opened a velodrome at Roubaix and then decided to mark it even more on the map by proposing a road race from Paris that would finish at the Roubaix Velodrome. The first Paris Roubaix race was held in 1896 and was supported by Le Velo newspaper. The race might seem wild now but in the early years it featured motorcycle and tandem pacing – this led to much angst and crashes. Paris Roubaix quickly became known for being tough, too tough for some, nonetheless in the early 20th century it had grown in stature. The race was to become a weapon in a newspaper circulation war (and politics) when the newer L’Auto edited by Henri Desgrange (the original organiser of the Tour de France) replaced Le Velo . France at the time had been rocked by the ‘Dreyfus Affair’ caused when Captain Dreyfus of the French army became a victim of a miscarriage of justice as part of an anti-Semitic conspiracy. L’Auto supported by the likes of tyre manufactures Michelin and Clement, sided with the government and anti-Dreyfus sentiment whilst Le Velo supported Dreyfus. With the ‘Dreyfus affair’ acting as a backdrop L’Auto took over the Paris Roubaix race and subsequently used it to grow their readership strongly, so much so that they felt able to organise the first Tour de France in 1909. Le Velo was to go out of business in 1904 before Dreyfus was exonerated in 1906 after spending years as a prisoner on the notorious ‘Devils Island’. Dreyfus went on to serve during the First World War and died in 1935. The Dreyfus affair caused a schism in France and which L’Auto played a strong role in promoting. The race starts in Compiegne, a forest well known as the place of surrender of the German army in 1918, and later the French in 1940. Paris Roubaix runs through the Picardy region and includes the coal fields of northern France – slag heaps mark the predominant flatlands of the area – and up to the industrial town of Roubaix (east of Lille), nicknamed ‘Little Manchester’ because of its successful textile industry located in French Flanders and close to the Belgium border. Belgium was the first continental European country to follow Britain in industrialising in the 19th century. The race route also runs near some of the most infamous points of the First World War such as Arras, Amiens, Cambria, Vimy Ridge and the Somme. Little wonder that the race became known as the ‘Hell of the North’. For many Paris Roubaix is a throwback echoing races held in the pioneer days when the growth in the popularity of the bicycle went hand in hand with a world turned upside down, gripped by social and economic change, and the unmade (‘orginal’) roads remain part and parcel of the race. For the initial kilometres of the race there is rolling tarmac where the teams work to keep their top riders out of trouble before all goes quiet when the race hits the first kopfsteinpflaster at Troisvilles – then the race explodes – dirt clouds envelope the air (wet or dry), bikes rattle angrily and screams ring out! 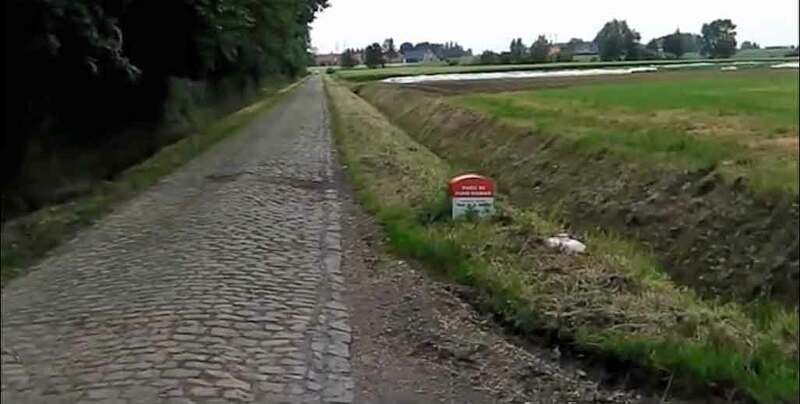 Later the win hopefuls will be sitting close to their team members as they hit the Arenberg hoping to stay out of trouble and be well positioned because many a Paris Roubaix has been lost on this infamous stretch of pave. 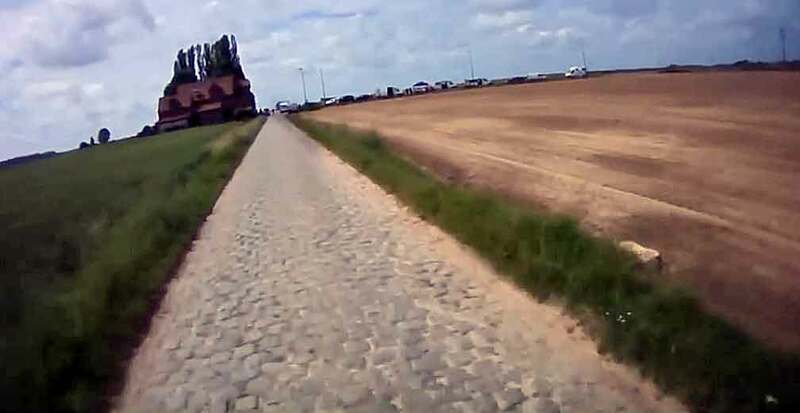 The real sort for the win is made at the Carrefour d’Arbre pave section before the run into the Velodrome in Roubaix. The original wooden track was burnt by the occupying Kaiser’s army in World War One for firewood and now it’s concrete. Paris Roubaix is the most visceral race on the cycle race programme and it is of course a monument of cycling and not just a ‘classic’. I have ridden the VC Roubaix sportive (not the ASO version) five times the last occasion was in 2012. 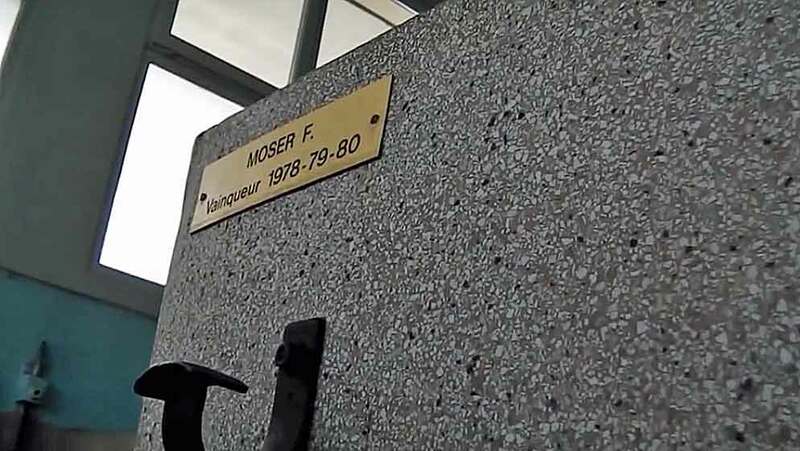 Pictures are lifted from my bike camera from the 2012 Paris Roubaix Sportive, plus a shot taken of a brilliant Geoff Waugh picture that he showed in a London exhibition.